What is life worth without the love you're meant for? When Grace Mitchell's job as a photojournalist sends her to Scotland with her young son, Cooper, in tow, her greatest wish is to escape from the aftermath of the wedding she abandoned. Instead, her life complicates further when she meets the mysterious, scarred, and alluring Eoghanan McMillan, a man so unlike any she's ever known. She falls for him quickly, but, after a spell sends them back in time to the 17th century, Grace is forced to accept the amazing truth about the man she's just beginning to know and to re-think the life she had planned for herself. Will their love for one another be enough to make Grace stay in a time so different from her own - a decision that will alter the direction of her young son's life entirely? Or will she sacrifice a future with the man she loves to give her son a life of normalcy? In the end, she may just learn that the decision isn't hers to make. Would you listen to Love Beyond Measure again? Why? Without question. It had me spellbound - which is why my review title states that "...Bethany and Lily have magic." I downloaded the book just after the polls closed on Super Tuesday. I did nothing else but take potty breaks until I'd finished it! If I thought the story was powerful when I read the ebook, I had no idea how it would capture and hold me while listening to it via audible. What was one of the most memorable moments of Love Beyond Measure? I'm going to challenge myself to word this to avoid the risk of presenting a spoiler - my most memorable moment was when Charles was walking Grace to the most magical day of her life and he shared with her how his wife let him know the depths of how/why she thought of Grace as their own daughter. I honestly cried as I listened to that part. There are many....to pick one would require putting them all in a hat and picking one randomly...and again it's hard to answer this question without presenting a spoiler, so I'll try to word it in a way as not to do so....the scene when Cooper knew he was facing imminent danger and the plans he made to face it and thwart it. Absolutely....although I hadn't planned to do that when I first clicked on 'listen now' that is what happened. I downloaded the book on my smartphone after I left my polling place on Super Tuesday...started listening to it on my drive home, continued listening to it as I entered the house and got settled and remained comfortably seated on the comfy couch in my office until it was finished....stopping only for bathroom breaks. I think this book presented the greatest challenge for Lily Collingwood to try to adequately represent the voice of a phenomenal child like Cooper. At the beginning I wasn't sure it met what I had conjured up in my mind that he would sound like after having read the ebook. But by the time I'd gotten half-way through the audible book, I was sold. This story was like new as I listened to it. Many times throughout my listening experience, I closed my eyes and got lost in what Lily was saying/how she delivered the story. When you're reading a traditional book or an ebook and you get to a point where you want to close your eyes at a particularly moving scene, the story stops until you can open your eyes and continue reading. But when you're listening, the story never stops....you can surrender to your emotions and continue experiencing the story. I cried, smiled and laughed while listening. At times...especially during the love scenes, I imagined myself reacting to the things that EO was saying to Grace and I felt the love. I would highly recommend this book to all fans of the Morna's Legacy series. If anyone who is unfamiliar with the series gets their hands on it, I recommend experiencing the books in order. This is book 4 of a series of 7 (soon to be 8). Yes, I enjoyed the story and the performance. Lily Collingwood is gifted with the ability to bring the charters their own voice. It bought the story into the present time and introduces Grace and Cooper into the magical world waiting for them in Scotland. It was fun to listen to them getting a glimpse of Eoghanan before they actually met him. Yes. I didn't want to put it down to go to work or to sleep. I can't wait for more of both Bethany Claire and Lily Collingwood's books and performances. This is a great book; this is the fourth book in the Morna’s Legacy Series by Bethany Claire and narrated by Lily Collingwood. Eoghanan “EO” McMillan is on the brink of death from his own brother’s blade. He finds himself in Morna’s modern day in the 21st century. Grace Mitchell is a photojournalist and her job sends her to Scotland with her young son, Cooper. While in Scotland she meets EO and falls for him quickly. When a spell sends them back to the seventeenth century Grace must rethink her life she had planned. If you are looking for a great romance with time travel, then you need to read this book. I can’t wait to read the next book by this author. Once I started listening to this book, I didn’t want to stop until the end. Fall in Love with this Book! 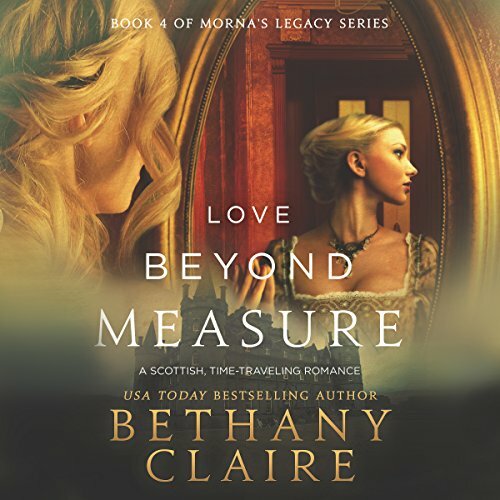 Love Beyond Measure is Book 4 in the time travel Morna's Legacy series written by Bethany Claire. These books are based in medieval Scotland, with some back and forth in the 21st century. Even though you could read this as a stand alone, the reader would definitely not know who some of the characters were, or the significance of their actions without reading the previous books. In Love Beyond Hope, Eoghanan was almost fatally wounded by a sword blade while saving his families life. To save his life, he was sent back to the 21st century so that the good witch Morna could heal him. In this book we find Eoghanan trying to build up his strength and time travel abilities so he can get home in time for the birth of his niece or nephew. Everytime he practices his travel abilities, he keeps seeing the same woman, Grace and her 5 year old precocious son, Cooper. As Eoghanan continues to be exposed to them, his fascination with them grows. Grace has her own crazy life in the 21st century--she's a runaway bride! So she's running to Scotland for some peace of mind, but instead, Eoghanan just stirs her all up and confused her, especially when she ends up in the 17th century due to some crazy magic spell! There is a great supporting cast of characters in this book, not the least of which is Cooper, the 5 year old going on 40. He is hilarious! Lily narrates his voice really cute. Also we have Jeffrey, Cooper's father-not-father. Yeah, I know...you'll just have to read the book to see what I mean! He ends up in medieval Scotland too! And then there's Ginty (boooo!) the bad witch, kidnapping and poisoning everyone. We hate her. With all of this you can tell this is another great Bethany Claire time travel book! I love all of the books in this series. I have read all of them at least once. Now I have the audio version and the story comes to life. Cooper is so cute and lovable. I love to hear his voice. He made the story extra special for me. Bethany Claire never disappoints us with her books. These audio books go with me on all of my rode trips. They are entertaining and makes the drive fly by. I read the book first, but the audio version makes it oh so much better! I love listening to the accents, the performance is great! It makes the story come totally to life. what a great book ! I loved the characters and the storyline flows well. It is a continuation from Beodin's story following Eoinin and Grace with Cooper and Geoffrey thrown in for good measure. A storyline that has drama, danger and romance enough to suit most. A good listen too (from Audible). I highly recommend it but first read/listen to the previous books as they flow into each other pretty well. Another great story by Bethany Claire. I have read all of Bethany's books so I am already a fan of her work. I do not usually listen to books that I have already read but I received this audio book as a gift. Lily Collingwood is a fabulous narrator and gives great life to wonderful characters. If you enjoy a good adventure, a nice love story, and some magic this is a book for you! This is one story in a series but it is easily followed and enjoyed as a stand alone book.